This June the Dechen Community will host the head of the Sakya lineage of Tibetan Buddhism, H.H. Sakya Trizin in London. 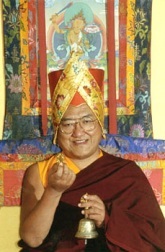 he will teach on the classical Sakya text “Parting from the Four Attachments” and bestow the initiation of Kalachakra. This teaching is a wonderfully clear and powerful introduction to the entire path of Mahayana Buddhism. Originally received from the bodhisattva Manjushri by Sachen Kunga Nyingpo, it provides clear guidance on the stages of the path of wisdom and compassion. This teaching is open to everyone and is a fantastic opportunity to hear a classic teaching explained by one of the world’s greatest living Buddhist masters. The Kalachakra tantra belongs to the Supreme Yoga set of tantras and thus contains the most subtle instructions on the achievement of Buddhahood. This particular initiation of Kalachakra to be bestowed by His Holiness belongs to the Vajramala collection of the great master Abhayakaragupta. The initiation of Kalachakra was first bestowed by Shakyamuni Buddha, manifesting in the deity’s form, upon King Suchandra at the stupa of Dhanyakataka in India. Subsequently the King took the tradition with him to his mystic kingdom of Shambhala, where it was preserved by a line of bodhisattva kings. It was brought back to India inthe mediaeval period by the siddha Chilupa. By receiving this initiation, one establishes the imprint of future rebirth in Shambhala at the time of King Rudra Kulika whose reign will bring about the renewal of the golden age. This two-day teaching is appropriate for followers of all the four schools of Tibetan Buddhism. To receive the initiation it is necessary to have taken refuge. Note that, although there is no practice commitment, one has to make the commitment to maintain the three vows, i.e. the vows of individual liberation, bodhisattva and vidyadhara. Thus for dharma practitioners this initiation is a wonderful way of obtaining or renewing these extremely important vows through the blessing of His Holiness and Kalachakra. It is necessary to attend both days of the initiation. 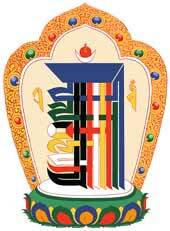 The Kalachakra belongs to the vajrayana, the highest and most profound of all Buddhist teachings. Receipt of this initiation is therefore greatly facilitated by a sound understanding of the nature and purpose of the vajrayana system in general, and its place within the overall Buddhist path. The definitive Sakya view on this is clearly set out in Rain of Clarity, an authoritative overview of the Sakya teachings and tradition, composed by Lama Jampa Thaye and with a foreword by H.H. Sakya Trizin.